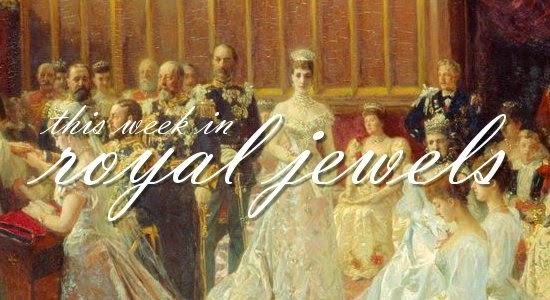 We're back in business with our weekly roundup of the most glittering royal jewels on display, everyone! Enjoy! 10. The always-elegant Crown Princess Mary of Denmark chose an eye-catching bracelet to award the Hans Christian Andersen Literature Award to Salman Rushdie on August 17. 9. Over the weekend, Mary and Frederik traveled to Northern Ireland to attend the wedding of actress Flora Montgomery and Soren Jessen. Mary paired sparkling pendant earrings and a delicate gold necklace with her pale pink dress and hat. 8. At the Polar Music Prize in Stockholm on August 26, Crown Princess Victoria of Sweden accessorized her H&M dress with delicate earrings made by Kreuger and stacked bracelets. 7. While helping to mark the 1000th anniversary of the Skara diocese, Victoria wore a pair of bold, dark blue earrings. 6. Pearls were Queen Silvia of Sweden's choice for celebrating the 15th anniversary of the World Childhood Foundation on August 23, including a two-stranded pearl necklace with a diamond and pearl clasp and a pearl bracelet. The necklace is said to have originally belonged to Silvia's mother-in-law, Princess Sibylla. 4. A grand celebration was held in the Netherlands on August 30 to mark the 200th anniversary of the Kingdom of the Netherlands, and lots of royals gathered in Maastricht to join in the festivities. On the day, Queen Mathilde of the Belgians wore her diamond and pearl wedding earrings, plus a diamond bracelet, a watch, and her wedding and engagement rings. 3. Grand Duchess Maria Teresa of Luxembourg appeared to be more amused by the celebrations in Maastricht than her husband! She wore a gorgeous pair of diamond and pearl pendant earrings with her green ensemble. 2. Queen Maxima was radiant as usual in Maastricht, donning one of my favorite pairs of her earrings: the diamond pendant earrings that originally belonged to Queen Juliana. Several different stones can be attached to these earrings; here, Maxima wears them with briolette-cut aquamarine drops from Queen Juliana's diamond and aquamarine parure. 1. Saving the best for last: we've got tiaras from a state banquet in Norway! King Harald and Queen Sonja welcomed the Estonian president for a state visit this week, and the royal ladies brought out the bling for the dinner on Tuesday. Queen Sonja wore the full version of Queen Maud's pearl tiara, while Crown Princess Mette-Marit wore her diamond wedding bandeau, and Princess Astrid wore her always-delightful winged aigrette. More photos here!